I wanted to add a little more detail to the branch, so this would help to draw the eye around the painting and to bring the focus onto the bird. I used Indigo and French Ultramarine Blue to create some shadows. 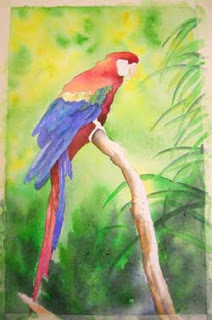 I applied the pigment to the left edge and under the parrots feet, then, cleaned my brush, tapped on the paper towel next to my palette, and used the clean, damp brush to soften the edge to the right. This technique can be used on any area in a painting where strong color is desired for one side of a smooth object, but a soft edge is required to make it look dimensional.